During the early years, late Rev. Maduluwawe Sobitha Thero was best known as at most venerated prelate, uniquely eloquent in Dhamma discourses most appealing to the learned as well as not so learned audiences all over the island. Despite the resounding admiration and appreciation received, he never ever exploited them either to gain cheap popularity or fame and never ever for any personal benefits. It is possible that Rev. Sobhita Thero might have believed that most of the people remain poor undergo oppression or suffering mainly due to their ignorance of the Dhamma. Hence might have dedicated him to traverse the length and breadth of the country to guide them in the Dhamma leading them to acquire a better quality of life. However, Rev. Sobitha Thero , being a visionary, may have ultimately realized, particularly after the constitutional changes in 1978, that, despite the people’s adherence to righteous conduct, they are unable to improve their quality of life mostly due to the rulers who take turns to deceive the public. Hence, he ventured to directly request the politicians to adopt a more humanitarian attitude in their treatment of the public and to provide a just and equitable system of governance to provide the much needed relief to the poor masses of the country. For this purpose Rev. Sobitha Thero utilized every opportunity including public meetings, discussions, and through print and electronic media, to appeal to the politicians irrespective of party differences, to adopt such an approach. When his appeals were not adequately responded, Rev. Sobitha Thero commenced a stronger campaign to insist on a change of the attitude of the politicians; he was subjected to explicit and implicit obstructions, censorships, blockades and many types of harassments. Once such direct and indirect obstacles, intimidations were aimed at him Rev. Sobitha Thero who became more determined on his mission, witnessed an unprecedented support from the general public irrespective of racial, religious or regional differences, spearheaded by many a civil society, university academic, and such other sympathetic activists. This was evident during the 17 year period commencing from 1978, when he led on behalf of the innocent and helpless masses, a number of forceful demonstrations against many social discriminations perpetrated on the poor masses. Rev. Sobitha Thero headed and personally led these movements quite sincerely for the sake of helpless masses but never with a slightest inclination to enter politics. There were many instances when the then rulers enraged by his movement subjected him and his supporters to many a cruel and inhuman treatments among which harassments at Abhayaramaya in 1986, at the Bodhiya in Pettah in 1987, and at the assassination of Lalith Athulathmudali in 1993 to name just a few. The clear display of fearless leadership, inspiration and guidance combined with and his uniquely effective eloquence clearly indicative of his undisputed potential to be a forerunner in the establishment of a future national level leadership. During the latter phase of the 17 year period, when many a lapse, including the deterioration of inter-racial relationships, and the emergence of a military environment, our Thero emphasized the urgent need for a national reconciliation process and effectively participated in the effort to end the 17 year rule. The action by Hon. Chandrika Bandaranaike’s to identify Naga Viharaya to make her first visit after assuming duties as the Prime Minister was a clear indication of her recognition of the significance of Rev. Sobitha Thero’s contribution to the political change. Despite the frequent visits to his temple by many political heavyweights in power, our Rev. Thero never ever even suggested any personal political favors, not even any facilities for his temple. However, he consistently urged them to fulfill the promises made to the people, Despite his major contribution to many political victories, from the day one of a new government, he identified himself with the people and not with the politicians, and consistently followed this principle demonstrating his infallible rectitude. In the Presidential election in 2005, he supported Hon. Mahinda Rajapakse in view of his main commitment to the abolition of the Executive Presidential system. However right from the following day, he reverted to his position to become the voice of the people and continued to pressurize the government to honour the commitments. Even though the termination of the 30 year long war was a matter of much joy to him, he was greatly distressed to witness the sufferings of the war affected people of all the communities. In this context, the adoption of the 18 th Amendment to the constitution further strengthening it, enhancing the family rule is the biggest insult ever perpetrated on Rev. Sobhita Thero. In the context of the above mentioned environment clearly indicative of a national disaster looming over the entire country, a large number of intellectuals from a variety of social and religious strata, kept on steadily and increasingly rallying around Rev. Sobitha Thero, urging him to provide the leadership to a much needed socio-political reform process. As a response to this public demand he had no option but to convene incidentally on his 70 th birth anniversary, the National Movement for Social Justice (NMSJ). His response to the public demand and the commitment to this cause is most significant for two reasons. Firstly, our Rev. Thero having by then dedicated self almost 60 years of his life, in addition to his religious and social services as an exemplary Buddhist monk, had all the justifiable reasons and facilities to lead a relaxed monastic life. Secondly, being subjected to various mental and at times physical harassments due to his steadfastness in the continuous struggle for justice and fair play always identifying himself with the victims of malicious socio-political maneuvers by ruthless politicians of every hue, he was afflicted with health problems. Hence, he virtually sacrificed his health and life to the call of the civilized society by fearlessly leading the moment to remove the root causes leading the country towards absolute anarchy and family rule. Recalling the heroic statements of our ancient kings such as Dutugemunu, Maha Parakramabahu and recently by politicians such as late SWRD Bandaranaike, Rev. Sobitha Thero summed up the objectives of the social movement when he fearlessly declared “I dedicate the rest of my life for the constitutional reform to abolish the Executive Presidency which is more destructive than an atom bomb in pulverizing an entire nation” This declaration when rippled through the friendly media, kindled the confidence and courage of a wider spectrum of society sans race, religion and even politics and transformed his movement to a mighty force. His entire concern was neither to topple a government and remove its leader nor to enthrone any other person but to change the existing system and create a nation guaranteeing social justice, respecting rule of law, equity of all citizens devoid of racial, religious or other forms of discrimination. Rev. Sobitha Thero with his inborn charisma and personality blended with sincere and selfless determination got on to the streets, openly critical of the barbaric acts such as the most inhuman treatment to General Sarath Fonseka who rid the nation of its 30 year savage war, and the callous process in removing the former Chief Justice. During the recent dark period when the entire country had become a virtual ruin further aggravated due to the absence of a leader capable of mobilizing a strong opposition, Rev. Sobhita Thero was compelled to fill the vacuum to provide the much needed leadership to a massive movement of the people. In this process several personalities such as Dr. Nirmal Ranith Dewasiri, Rev. Dambara Amila Thero, General Sarath Fonseka and several political parties joined him further strengthening and accelerating his forward march towards the creation of a just and fair society while the main opposition was just witnessing the process. Many a Civil Society organization which had hitherto been in a state of hopelessness got gradually energized once the general public inspired by Rev. Sobitha Thero’s sincerity and determination displaying a tremendous faith and confidence in him. By then, the people had lost the confidence in the opposition political parties which had become ineffective either succumbing to the pressures or the hidden privileges of the then government, or through the conviction of their incapability to win a future election. Within this context the National Movement for Social Justice led by our Thero turned out to be the people’s only option. He guided the Movement to draft a set of conditions which was presented to all the dignitaries commencing from the Rev. Mahanayakas and to the leaders of all political parties pledging the support of his movement to anyone who accepts the condition to abolish the Executive Presidential system. The Thero scored one immediate success when the United National Party which had hitherto not publicly announced its decision to abolish the Executive Presidency declared its support. This was further strengthened with the active support by the likes of Deshabandu Karu Jayasuriya, Rev. Girambe Ananda Nayaka Thero, Father Ried Shelton Fernando etc. Once Rev Sobitha Thero further accelerated his campaign through a series of well attended public meetings sponsored by enthusiastic activist all over the country, some other opposition politicians who were lukewarm so far, commenced to rally round him. While inviting the then President and the then governing Party through public meetings to immediately abolish the Executive Presidency, he kept on addressing all the leading opposition Parties finally managing to bring almost all the opposition Parties to a common platform. Within a relatively short period of time, the Thero’s movement grew into a massive campaign with the tremendous enthusiasm and active support by millions of people sans racial or religious factors and from the urban, semi urban as well as rural sectors from every part of the country. At this point of time, he called upon all the political parties to consider a common candidate capable of getting their collective support. Once he noticed a considerable delay in such a process, he declared that in the event the opposition is unable to identify such a candidate, he will come forward with a clear commitment to abolish the Executive Presidency within a time frame of 120 days and revert to his temple. This statement created shivers not only in the President in power but also a few leaders of the then opposition who had been scheming to become Presidential candidates. Ultimately, Rev. Sobitha Thero, through his patience, determination and courage blended with selflessness , and with the backing of a widest political and civil society groups, he was able to effectively lead and coordinate a process to identify a common candidate which was a real surprise to all the stakeholders. Inspired with such an initiative, we have to appreciate the courage and the contribution of Hon. Maithripala Sirisena who agreed to contest as the common candidate on the face of numerous challenges including a direct threat to his life, and the statesmanship of Hon. Ranil Wickremesinghe who sacrificed his obvious candidature, and the active support of a wide array of politicians, numerous political and civil society groups sand their leaders, and the venerable Maha Sangha and many other religious leaders to achieve this historic landmark in the modern history of Srilanka. Finally, the silent revolution led by Rev, Sobitha Thero over a period exceeding two decades achieved its goal on 8 th January 2015, facilitating the creation of a society guaranteeing Social Justice. Since there have been many a write up on the progress made after 8 th January 2015, our main focus today should be to carefully determine the future role to be collectively played by all of us for the achievement of the goals set by our late Thero. The main announcement made by Rev. Sobitha Thero on his recent 73 rd birthday was a reiteration to the leaders of the government to fulfill the undertaking they had given to the people at the elections through the implementation of the tenfold proposals he had presented and accepted by them and thereafter approved by the people, ie, the enactment of a new constitution for the establishment of parliamentary system through the total abolition of the Executive Presidency, empowering the democratic institutions and to create a just and fair society guaranteeing the equal treatment of all races and religions in the country. Hence, it is the bounden duty of the present leaders of the country to fulfill those pledges if they are sincere in their homage to him. All the social activist, civil society organizations and the many political parties who had collaborated with the late Thero, have an unredeemable duty and responsibility by the nation, to continue the pressure on the political leaders to make Rev. Thero’s vision i.e., the creation of a just and fair society a reality. I wish to recall one of the statements of Rev. Sobitha Thero at made just before the last Presidential Election. “ Just consider Mahattayo! Can you see a single person who could be called a national leader today? We had quite a few of them before 78. What a number of Sinhala, Tamil and Muslim leaders we had who struggled risking their lives during our struggle for independence.? When the government was formed in 77, great persons with moral strength functioned as ministers. They all had a vision and a philosophy. But sadly, over a period of 37 years of Executive Presidency, all such leaders have either been annihilated or disabled. Today, we have only a set of puppets” This illustrates the deterioration of the polity under Presidential rule, to the extent of non emergence of a national leader again. Under this Executive Presidential system, even a dignified person ascending it will soon degenerate to such a level so much so that by the time they complete their term. All the national leaders who fought against this system have been destroyed. The Parliament has sunk to the level of a dark shell which prevents the emergence of any person with a caliber of national leaders thus destroying the country and its future generations. Finally, the country has lost the illustrious personality our Rev. Maduluwawe Sobitha Thero who fought for 35 long years to end this system. This alone illustrates the horrific form of the Executive Presidential system. In the context of such a situation, there is no rationality in delaying any further, to utilize this unique opportunity to end this corrupt system or destroy ourselves completely by upholding the same. Finally, my conception is that this unique personality, Rev. Sobitha Thero was a “Bodhisatva of our time”. He no craving for anything worldly, least for politics. As I see him, he as a true follower of the Buddha was consistently sympathetic to the suffering of poor and helpless people and did everything possible including the abolition of a dictatorial system of governance as a means to relieve them from misery. He had a longstanding habit to be up by 4 in the morning, and any time before 7 in the morning was the best time for anyone who want to meet him, because, thereafter, the priest would be extremely busy with activities such as, Bana preaching, religious functions, Dana, lectures, conferences and such other functions in every part of the country. If he had accepted an invitation he attended to all of them with extreme punctuality without any concern for his health. Being a strong adherent of the Buddha’s teaching “ Appamado amatapadam, pamado maccunopadam” he always used to say “Mahattayo, during this short span of our life, we should not waste even a single minute in providing our maximum service to the people’ . I have observed that our Rev. Thero treated all alike, and never discriminated any one, and the most humble peasant received the same compassion and attention from him and attended to their requests even using his own resources. Even in many instances when he was not in the best of health, he always gave priority to his commitments. Following Buddha’s advise “Sunatha dharetha charata Dhamme” , “Bahujana hitaya, bahujana sukhaya” during a span of over 60 years as a priest, he toured the length and breadth of the country preaching the Dhamma, as well as fearlessly intervening when the country or any group of innocent people faced with any disaster, and venturing to speak and act on their behalf, irrespective of their race, religion or political convictions, undeterred by the insults, defamations or threats to life. In many such instances, when we discreetly made some security arrangements, the Reverend Thero used to tell us “ Mahattayo, I feel comfortable to die in serving the people. So why should I have security guards?” Thereafter, whenever possible I used to accompany him when visiting distant places, even during such visits he always spoke with a deep understanding of the problems of the people and the possible solutions to many of them. I was often shocked with his comprehensive knowledge of many of the issues, and his vision, the commitment and the sincerity in resolving them, and am convinced that our country could have advanced a lot had many of our politicians possessed such qualities. To my understanding, after Late Prime Minister Hon. 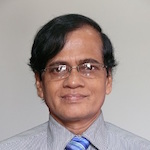 D. S. Senanayake, Rev. 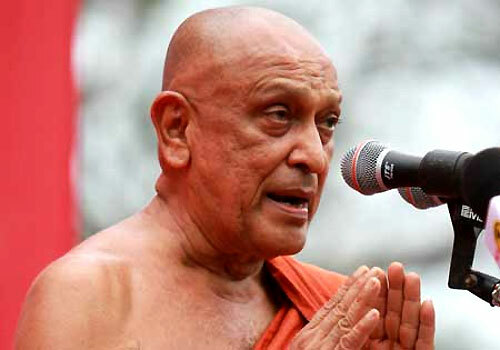 Sobitha Thero is one of the few great national leaders of Sri Lanka, who could effectively achieve an inter- racial and inter-religious unification in the country. He was fully convinced of the need for all of us to feel and act as a nation of Sri Lankans, which is an un- negotiable prerequisite for national prosperity. In reciprocation, he was recognized as a father figure by the vast majority of the moderate Sinhala, Tamil and Muslim citizens of the country. Rev.Sobhita’s vision was that the real advancement of the country is achievable only through the emergence of a Sri Lankan nation with a collective effort by all the citizens sans any racial differences. The utmost and special quality I had observed in our Thero was that he had no animosity towards any person, and his concerns were only with regard to concepts and not with any personalities. He believed that mere shift of personalities without changing the system will not meet the objectives and continued to identify himself actively with a revolution to alter the same. In his approaches, even opponents were treated as noble friends, demonstrating the sublime qualities of a real Buddhaputra with a boundless compassion , kindness, sense of detachment and equanimity. Sobitha Thero dedicated the entirety of his sixty years of his priesthood for this purpose, sacrificing his health and finally succumbing to his grave illness. Hence the best respect we could offer to him is to mould our lives as inspired and guided by him and to provide our maximum support to achieve his dream “a society ensuring social justice”. As for our political leaders , the greatest tribute they could pay him is to sincerely dedicate themselves to act in terms of the commitments they have pledged to our Thero to create a society guaranteeing social justice. Finally, during the period Rev. Sobitha Thero was hospitalized for approximately two months, the only request he made from all the politicians both in power and in the opposition, was to continue the process already commenced and to develop our country and bring the much needed solace and happiness to the suffering masses. Even when the members of the NMSJ visited him he always used to request us to get all our members including Prof. Sarath Wijesuriya, Rev. Ried Shelton Fernando, Dr. Nirmal Ranjith Dewasiri etc, and all others including Ven. Dr.Dambara Amila Thero, Deshabandu Karu Jayasuriya who have been with us to continue with the Movement to make our collective vision of a “Sadharana Samajeyak” a reality. I can never forget his last words to me when I met him last, on the 30th of October, when he said that he will not have any other joy in the world except to witness a Sri Lanka, having abolished the Executive Presidency, safeguarded Democracy, created an environment of freedom, protected human rights, enabling people of every nationality or religion, to live together as true patriots and as children of the same mother, enabling our thrice blessed land to succeed like many other countries in the world., in other words the creation of just and fair society in which all the people enjoy to live with real contentment. Thanks for such a balanced, unexaggerated, yet interesting recalling of a life well spent, by a man who clearly, by rising above worldly ambitions has shown us the way forward. Let us humbly hope that we succeed in following his wonderful example, by not asserting too much! RE: Sobitha: The Real Architect Of The January 8th Revolution. All the People should be very thankful to Rev. Sobitha Thero, the visionary. Ven. Sobitha Thera made me proud of being a Buddhist from Sri Lanka. He put the dharma to practice and made Sri Lanka a better place. At a time when some monks had embraced hatred and used violence against minorities to prove their relevance, Ven. Sobitha approached problems in our society with utmost compassion, kindness, love and without discrimination and embraced humanity without prejudice or bias. I believe he had single-handedly repaired much of the damage to Buddhism by extremist radical thugs in saffron robes who call themselves monks. As Buddhist we all know right from wrong, we all know about the teachings regarding Mudita, Upeksha, Karuna, maithree. However all that is just academic when it comes to practice to the average Buddhist in Sri Lanka. Most people savor the thought of feeling superior to other fellow humans and would go to any length against all logic to achieve it, they let their primal instincts get the best of them. The easiest way we could feel better than others is by using our superiority in numbers over other races. So we play the Sinhalese card then the Buddhist card and so on. Once we have achieved our aim then we start playing the UP country low country game or the cast system among our selves. And so on and so forth, the list is endless. All this is in order to quench our insatiable “inferiority complex” for whatever reason. Its there in almost all south Asians irrespective of Nationality, tribe, cast or creed. Politicians capitalize on these traits and weaknesses to exploit the masses and achieve their selfish goals. In spite of the odds Ven. Sobitha steered us, at least the majority of us, in the right direction. May he attain Nibbana. Hope theSinhala version gains maximum publicity. There’s a urgent need to have a Tamil translation too.